8/19/2007 - I guess I didn't get much written before the trip. I've just gotten back from the RAVS trip to Georgia. I've learned to do the Georgia Wave (at the gnats that were out) and we got a lot of dogs and cats "spayed" and neutered. I didn't take the camera but I hope to get photos from postings on Facebook to provide some narration of what happened. The students were great, as always, and there were plenty of veterinarians to allow good support for their work. I'm pretty "beat" tonight and have my work cut out for me trying to get caught back up after being gone for a week. I appreciate the work of Dr. Fiacco and the staff in keeping the world in order around here while I was gone. I'll try to get some pictures up in the next week. 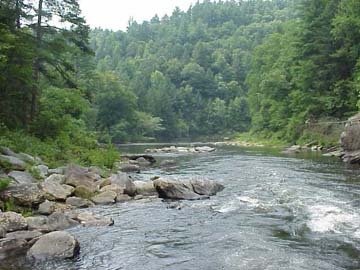 The picture of the river doesn't have anything to do with anything but I told some of the students that part of why I came to South Carolina was a camping trip here. This is the view from my campsite. I hate to say it's been more than a year since I've been there and a couple of years since I camped there. Wish I was there now! I'm finally getting some shots up from my trip to Georgia for our RAVS trip. 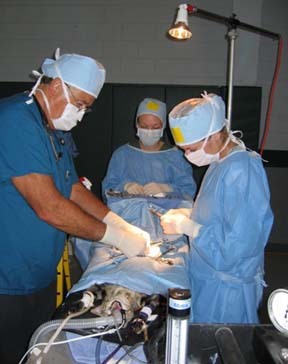 In this shot Gretchen, Lauri and Dr. Brown "get it done" with a big fat dog "spay". For those of you that don't know what RAVS is all about the Rural Area Veterinary Service is an organization that loads up a big truck load of veterinary equipment, intruments, drugs and supplies and heads off into the parts of the country that are LEAST served by spay and neuter services. They then recruit a bunch of old timers and young idealist veterinarians to add some salt to the stew. Then dozens of young veterinary students PAY to volunteer a week of their time to sleep on a gymnasium floor and put in about 14 hours a day performing sugery that they have READ ABOUT, been tested about, maybe watched but (in many cases) have never done. In most cases they are NOT in a college surgery suite but in a gymnasium, cafeteria or (in this case) an art museum. Six surgery tables are running at the same time. 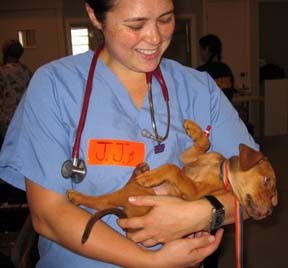 Many of the patients don't HAVE a veterinarian. 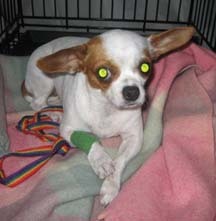 During the trip about 300 patients were spayed or neutered. It's wild, scary and tough. For me it's "the thing that restores my belief in American kid between the age of 20 and 30". These are great kids. I really mean that it changes my attitude every time I go on a trip. I say this every time but I will have to say it again. 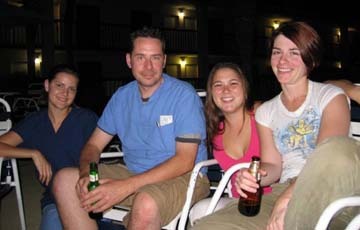 I have NEVER met a "slacker" on one of these trip. As Dr. (Jerry) Brown said, "You would hire any one of these kids". They have to be scared. They don't know us, they don't know that they know what they need to know. It almost reminds me of a sky diving instructor pushing their student out the door of the jump plane . . . "You start the incision here". It is truly a thrill to see these guys come along during the week. Dr. Brown, from Washington (state), has been in practice for 30 years. This was his first RAVS trip. He was a wonderful teacher and I think he had a good time. I'm SURE he influenced some careers with his patience and experience. 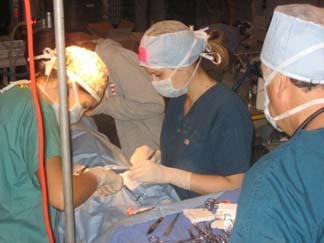 This IS me in this shot finishing up a surgery. In this shot you can see the general set up. 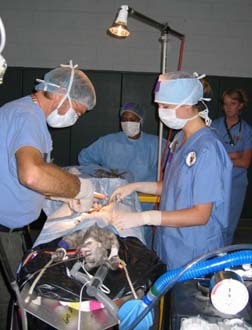 There are always 2 students scrubbed in for the surgery and another student montoring the anesthesia. 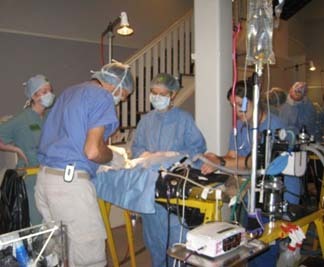 The anesthesia equipment and monitoring equipment is standard for most veterinary practices though the surgery table seems like something that I would have been proud to have improvised. Blood pressure and oxygen saturation are monitored much like will be done by the students during their surgery rotations in school. The students are gowned and gloved in as would be at school. As you can see here, I am NOT wearing a gown. 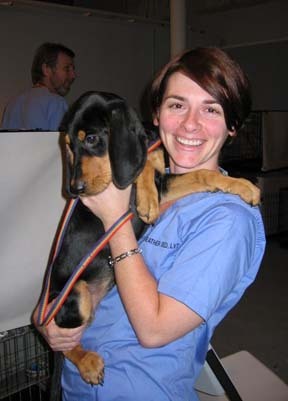 It is very common that the "supervising veterinarians" will go from table to table and may "glove in" several times in an hour on several different surgeries. In this case the "time limit" was approaching and we are required to "finish up" the surgery to limit the risk to the patient. That said, on this particular trip there was only ONE patient that had to return for complications after the surgery and that was a patient that I had "finished up". I had all sorts of concerns about what had gone wrong but in retrospect I'm pretty sure that the problem was associated with bleeding from MY closure, not something associated with the rest of the surgery. I guess the "teacher" got a lesson! We do surgeries on patient of all ages. 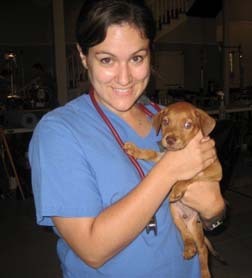 Christine Pelland holds a pup getting ready to be neutered. This looks like a young one! The students are broken up into groups each day. One group is involved with admission and recovery. Another is responsible for the anesthesia. A third is responsible for the surgery itself. EVERYBODY is responsible for making sure that the patients are comfortible and that the outcome is good. EVERYBODY could be counted on to make sure. This may be the same pup, or maybe not. I think there was 3 pups in this litter that were being spayed / neutered along with the mother. For a spay / neuter guy like me this IS the gospel being delivered. Dr. Brown helps some students with an issue of question. One other interesting thing happened today. Some of you may remember Sugar, the dog I brought back from my trip to the Gulf Coast in 2005 and returned to her owner the following March. I got an e-mail today from Mrs. Horton. She didn't send pictures but said that Sugar is doing great and getting fat. She is a little disappointed in the progress in New Orleans but I guess we all are.